I loved Haunting Violet. It was an amazing paranormal mystery that I just loved. Something that the summary doesn't mention is that it takes place in the 1870's, which makes it historical fiction, but it really worked well and I loved it. Violet is a really unique girl. She was strong and smart. She was always reading too, which made me like her more. Her mom was a crock and she kept on coming up with new schemes and ideas for what to do. Colin was such an awesome guy. He was such a sweet guy and wanted the best for Violet. He was definitely swoon worthy. Elizabeth was a smart girl too and a good friend to Violet. 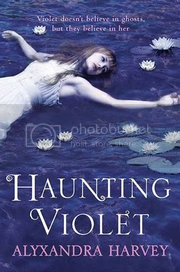 The plot of Haunting Violet was quick paced and full of mystery. There were several creepy scenes in the book from the ghosts as Violet tracked the murder. Harvey's writing was gorgeous. I enjoyed every moment of this book. Harvey really knows how to write and I am excited to read more from her in the future. I highly suggest that you read this book as soon as possible. I second that people should read this book. :) I'm almost finished reading it myself and am loving it.